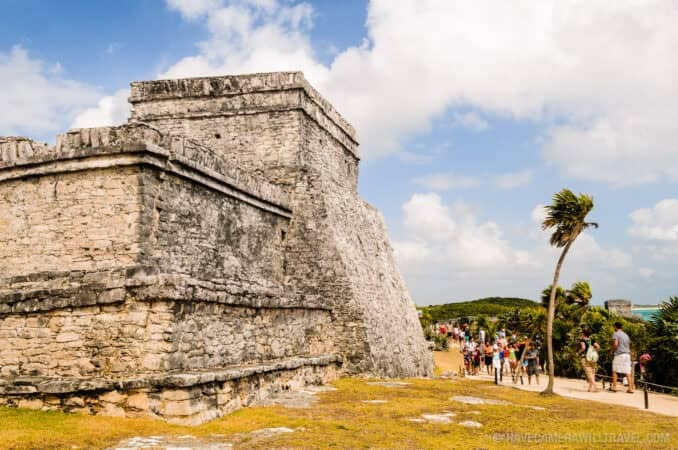 They don't call it the Riviera Maya for nothing.1 Seven hundred years before all-inclusive beach resorts, ice-cold mojitos, and someone decided that a perfectly good beer needed a wedge of lemon, the Maya built a city with a stunning ocean view. 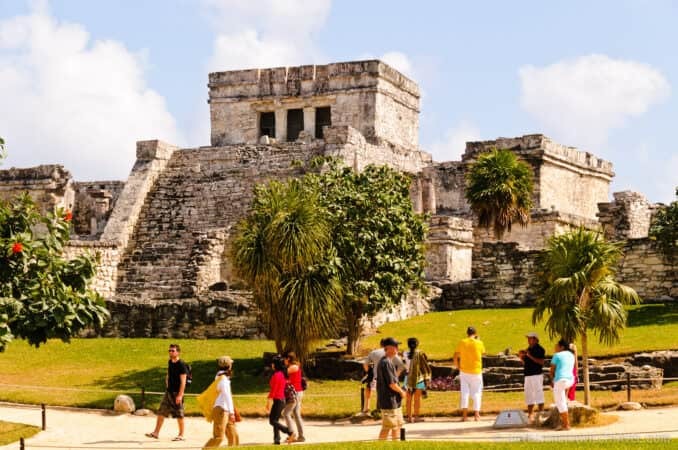 There are many Maya civilization sites on the Yucatan Peninsula, but none has a more beautiful location than Tulum. 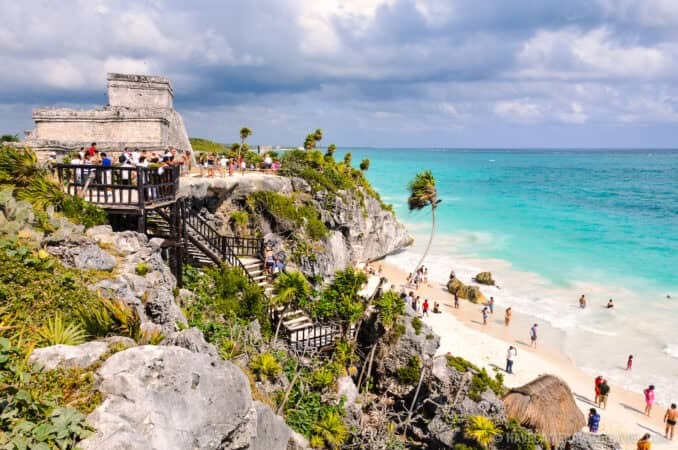 On small rocky cliffs above white sandy beaches overlooking emerald green waters, it showcases the coastal beauty of Riviera Maya (also known as the Mayan Riviera). And it shares with Cancun what must be Mexico's best sunrise, with the tropical sun rising over the beautiful Caribbean Sea. And that is why the city was also known, so far as can be established, as Zama, meaning City of the Dawn. These days, it's known as Tulúm, meaning "wall" or "fence." When you arrive, you'll quickly see why. Entering the city means walking through a narrow opening in a stone wall 8 meters thick and up to 5 meters high that protects three sides; the fourth side is protected by ocean-facing cliffs. 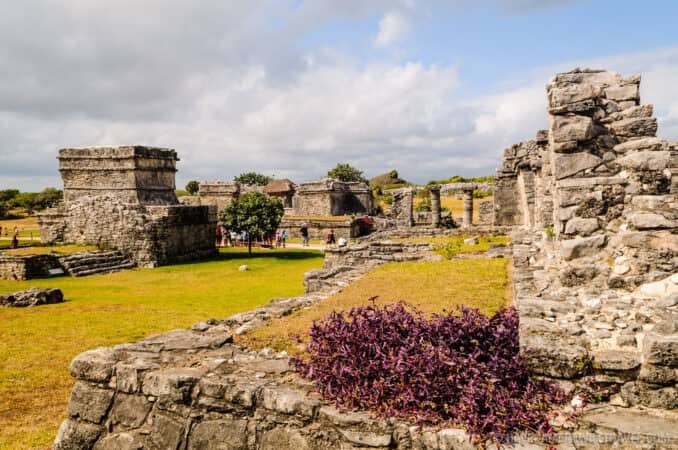 Walls like Tulum's weren't typical in Maya cities. 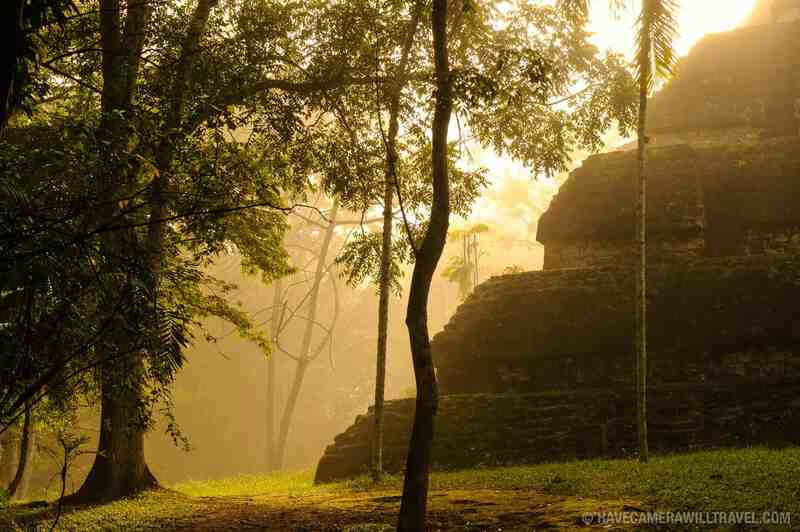 Some of the biggest cities, like nearby Coba and Tikal further south in Guatemala did not have any obvious defenses. Of course, even in this case, the wall was only protecting the royal and religious parts of the city--most of the people lived and worked outside the walls. Like most Maya cities, the site radiates from a Castillo, the tallest building occupying pride of place. In this case, the Castillo's columns are designed to look like serpents. 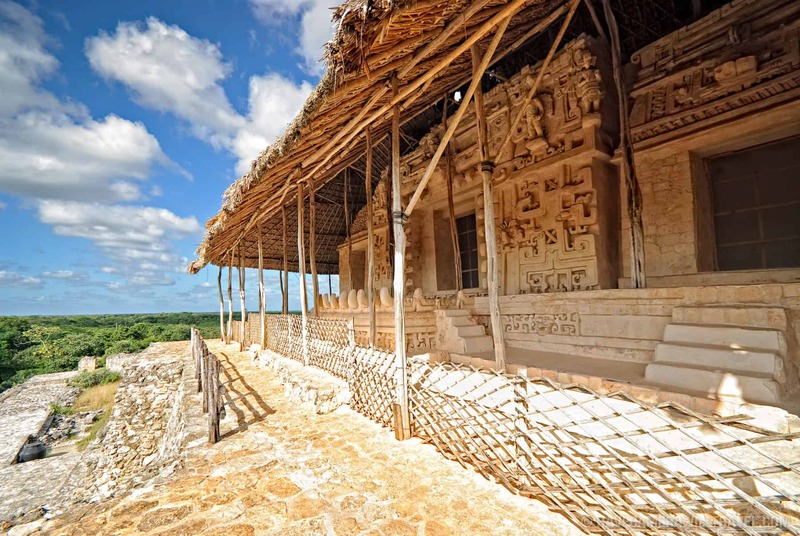 Although the site is much smaller in scale than Chichen Itza, its architectural features are similar, and several of the buildings are very well preserved, among them the Temple of the Frescoes and the Temple of the Descending God. 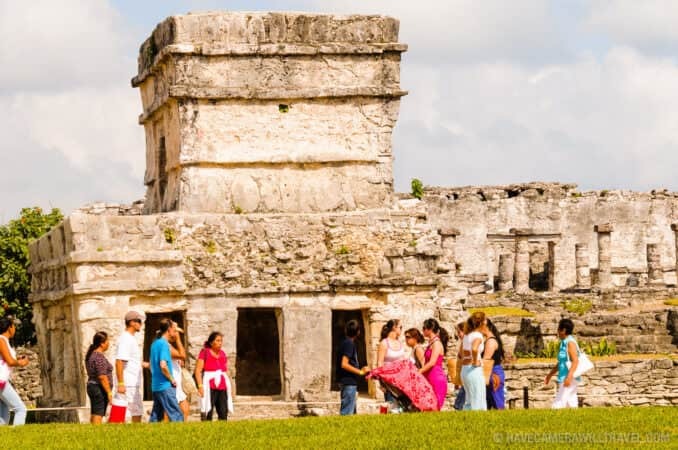 Originally, there was also a cenote within the walls providing the city with a protected and self-contained source of fresh water. The location is beautiful, but it is also strategic. 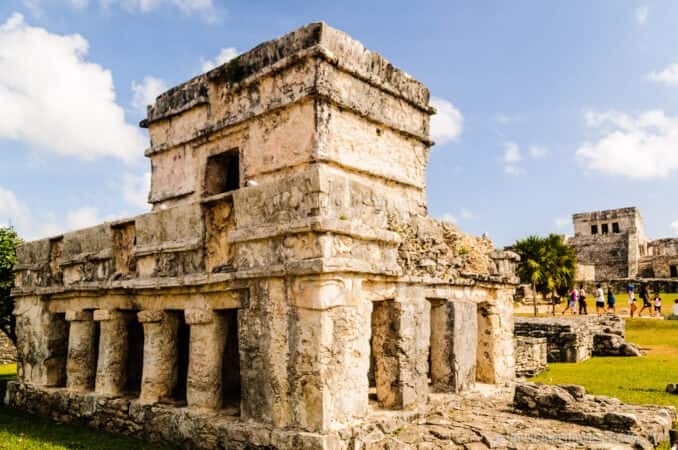 It was connected by road to the much larger city complex nearby at Coba and sea to other coastal areas of not just the Yucatan Peninsula but throughout Central America, even as far, by river, as the Guatemala Highlands. 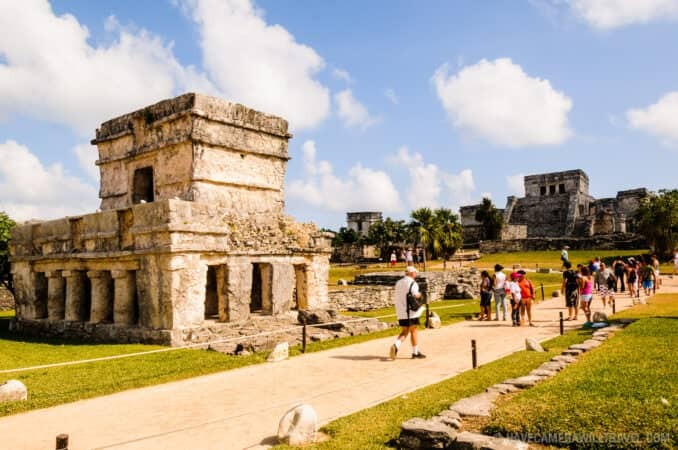 Tulum was one of the last of the Maya civilization cities and appears to have peaked during the 13th and 15th centuries, even lasting several decades after Spanish occupation of the region. 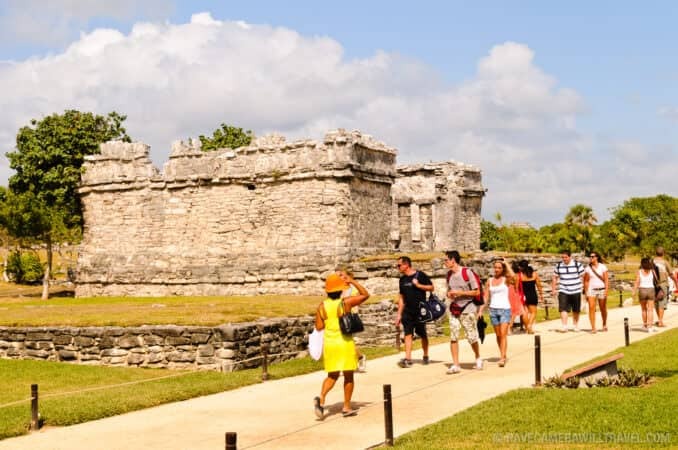 These days, the Tulum Archeological Zone (there are also a Tulum hotel zone and a Tulum commercial zone) is one of the most-visited Maya civilization sites in the region. 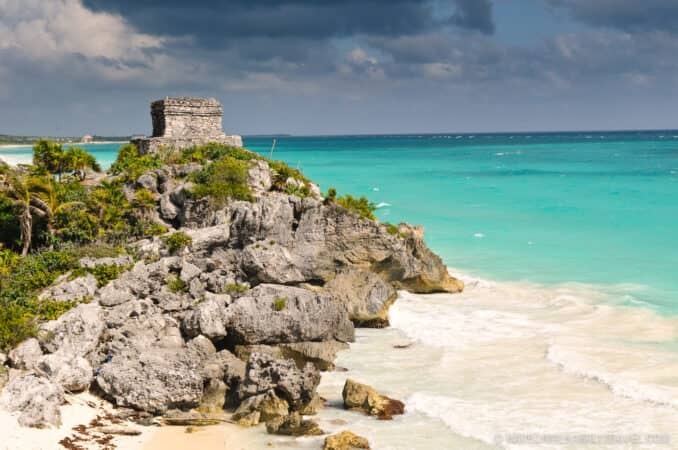 Being an easy day trip from Playa del Carmen and Cancun certainly helps, but you simply can't beat the beautiful location. Go early. You can't catch the sunrise from within the site, but you can beat the tourist buses. The park opens at 8 am and closes at 5 pm. Take your beach gear. The beaches are small but stunning! Take a bottle of water. There are no refreshments available within the ruins, and it can get hot, even with a sea breeze. Take a hat. There's not much in the way of shade to escape the Mexican sun. The parking lot is about 1km from the actual ruins. You can walk or, for a small fee, catch a tram that runs back and forth. The site is pretty compact as far as Maya cities go. 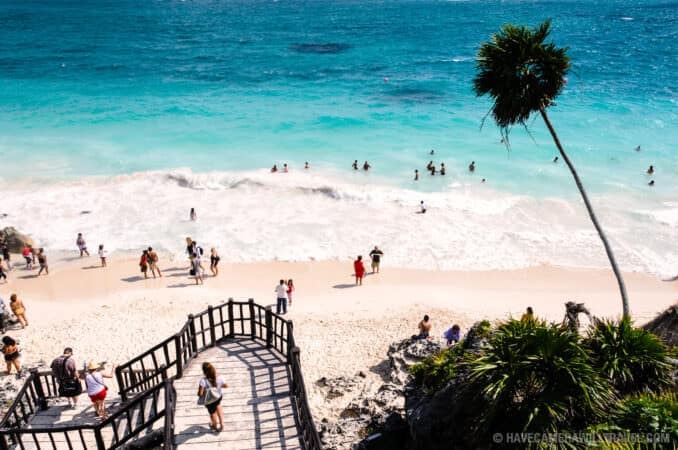 Unless you're planning on spending some quality time on the beach, you can take in Tulum without rushing in an hour or two. 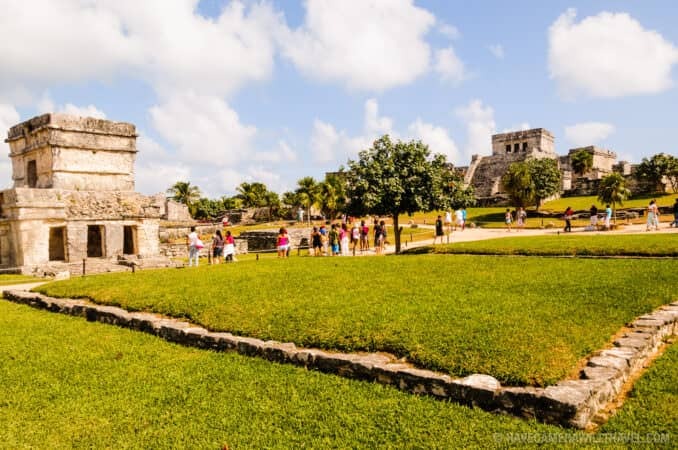 If you have a car, it's easy to visit both Tulum and Coba in the same day. There are very few roads across the Yucatan Peninsula, so you have to try hard to get lost, and the roads are very straight and very flat. 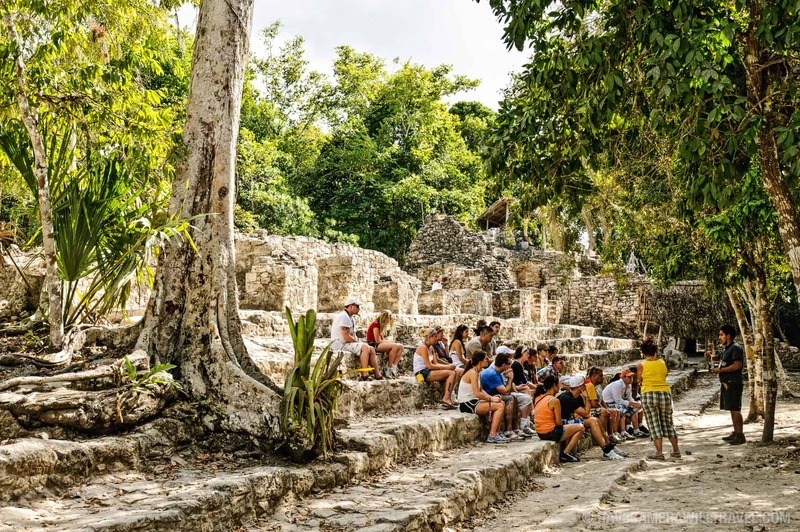 If you get an early start, you could even make it to Ek'Balam or Chichen Itza. 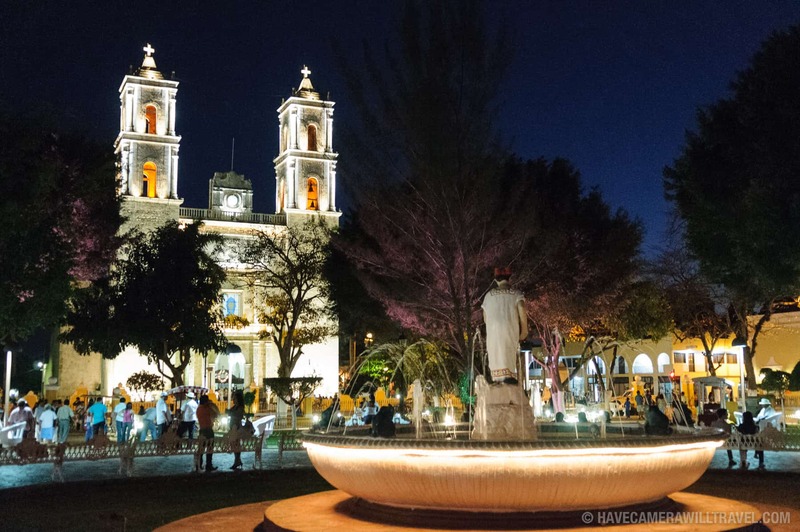 If you're heading to those sites and want to spread it out over a couple of days, it's worth including an overnight stop (or two) in Valladolid. 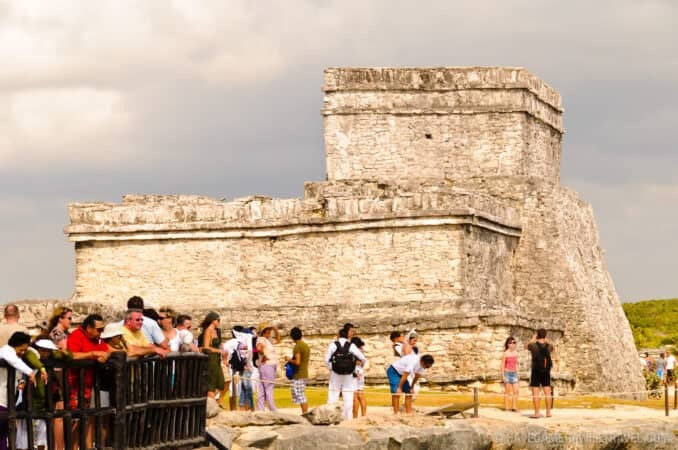 You can find the latest U.S. Department of State travel advisories and information for Mexico The Caribbean (such as entry visa requirements and vaccination requirements) here. The British and Australian governments offer their own country-specific travel information. You can find the British Government's travel advice for Mexico The Caribbean here and the Australian Government's here. The CDC makes country-specific recommendations for vaccinations and health for travelers. You can find their latest information for Mexico The Caribbean here.